THURSDAY: a rollicking good time was had by all! – Ce Soir Arts – Be inspired tonight! THURSDAY: a rollicking good time was had by all! What a line-up today! Wow! To start us out, at 1 PM SLT, AMFORTE Clarity stepped to the Ce Soir stage. There’s nothing better than hearing an artist with a unique perspective, and AMFORTE certainly brings that to her music. She can sing RadioHead, Cranberries, and a whole host of covers that are very well-chosen to let her show off that outstanding voice and command of the guitar and piano. A true musician who is focused on learning and exploring her own talents, AMFORTE is a stunner, letting her punk/rock roots show and making every song her own. She has a great name, because her voice is indeed, strong and clear. She doesn’t miss a note – and she sings Adele better than anyone we’ve heard. Exceptional music, sensitively sung and played, with emotion and conviction; I LOVE IT, and today was no exception! Add to all that a delightful stage presence, a warm connection with her audience, and some simply wonderful original songs, and you’ve got a winner on your hands! Great show, AMFORTE – as always! Then, at 2 PM SLT, we had another singularly exceptional artist on the schedule (in her weekly spot – a fact that thrills us no end! ): JORDANREYNE DEEZUL all but defies description – and you know what I mean if you’ve heard her. She’s a powerhouse of song, with a voice that is distinctive and beautiful. Indeed, the lovely notes that wend their way around the factory sounds and steam that is part of Jordan‘s musical landscape is so very moving and her original compositions are stunning. Folk noir and industrial electronica meet Celtic melody in a completely astounding way that grabs your attention from the start and keeps you mesmerised throughout her set. That flowing red mane is perfect for Jordan, because musicially, she’s on fire! She was on it, today, let me tell you – and the crowd was simply humming with the energy and singing along at every turn. Do not miss any opportunity to hear this music! Whether it’s at Ce Soir (every Thursday through August at 2 PM SLT) or elsewhere…hie thyself! You won’t regret it. How to follow those two? 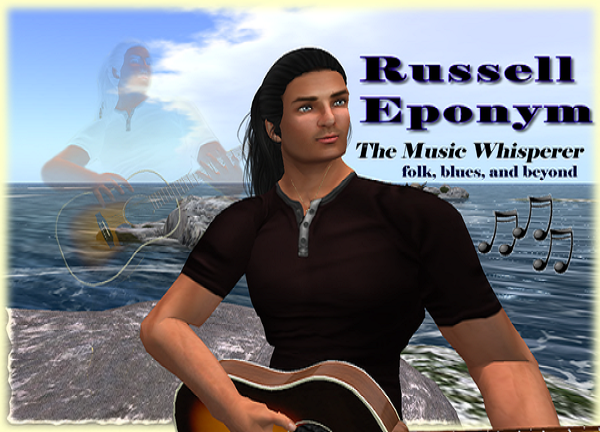 We have just the one: RUSSELL EPONYM! Everybody loves Russell, and there is ample reason why. He’s kind, generous, and wise…and he writes such beautiful poetry and songs, sharing them with all of us in his recitations and concerts. His “folk, blues, and beyond” is his alone, and he can do it all with a finesse that is rare indeed. Russell plays guitar with a particular fingerstyle and can pick the banjo, make the harmonica sing, and get that kazoo going! How he does it all – whilst singing in that very soothing voice – is amazing, but he certainly does it, and with style. Russell is the consummate artist…and he brings every ounce of his expansive acumen to bear in everything he does. We love Russell and his kind and happy Eponymous Family, many of whom join him here at Ce Soir every Thursday at 3 PM for a rousing show of great music. They also gather to hear his poetry recitations each Tuesday at Noon SLT…and there’s MORE! Check the next post (teehee!)! At 8 PM SLT, after such a great day, we were quite ready to chill with MoShang Zhao, The Sound Jeweler. Indeed, MoShang arrived to wrap the night in silken threads and tones so soothing and energising that we’ll be ready for rest or a lively day ahead. MoShang and his music are favourites at Ce Soir, and we love Thursdays because it’s time for the fabulous Chinese Chill. This night, he brought some new music along for us to enjoy – and that’s just what we did! Swaying to the rhythms, taking a nice deep breath, relaxing and taking it all in! There’s just something about MoShang‘s music that calms and relaxes the mind, while at the same time, engaging and sharpening perception. It’s a new take on things, something truly fresh and alive, each time. We don’t know how he does it, but he takes those street sounds and other inspirations from his environment and polishes them to musical perfection! Thank you, MoShang! Great set, as always! And so, we move into another day. Filled up and happy, rested and relaxed. What better way to take on the weekend? Have a great one! Previous What happened to Wednesday???? Next ANNOUNCING: Russell Eponym – Renaissance Man Extraordinaire – Watercolour Exhibit in the Ce Soir Guest Gallery Opens!